This property was purchased in 1839 by C. C. Van Horne, who was the first postmaster and first teacher at Gougar Crossing. Van Horne apparently was interested in the property, comprised of 80 acres, for investment purposes because he sold it within a few months. Van Horne later became the first mayor of Joliet, where he had set up a law practice. By the 1850s the town began to grow at the center of New Lenox Township around the streets of Cedar Road and Maple Street (later the Lincoln Highway.) John B. Salisbury, who is listed in some sources as the blacksmith and by another as a carriage builder, purchased the property in 1856. When the post office was removed from Gougar Crossing to the town, Salisbury was the postmaster from 1858 to 1865. The earliest known photograph, showing only a portion of the house, may date from Salisbury’s time or shortly thereafter. Records seem to indicate that the house was there in Salisbury’s time. 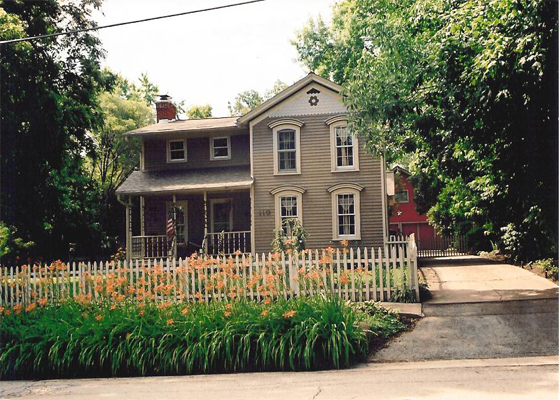 Dr. A. Miller converted the front parlor (northwest corner) to a dental office when he purchased the home in 1936. Patients waited in the other parlor or on the front porch. In addition Dr. Miller gave school dental checkups to a large number of students who attended the nearby New Lenox Grade School. When Jan and Steve Filipiak purchased the home in 1990, they did extensive renovations to the house, added the current color scheme and did extensive planting. Jan also researched records of the history of the home and the property back to Van Horne’s time. Additions were made to the back, keeping the front façade as it was over a long stretch of its existence. The Salisbury home 2009. This is a private home and is not open to the public.